Strange sinuous tunnels as long as 18 centimeters (7 inches), bored into the bed of a shallow sea 2.1 billion years ago, show that something big was moving a billion and a half years earlier than motility was thought to have developed, a huge international team from a host of disciplines reported in PNAS on Monday. “Big” means “bigger than a bacterium,” not elephantine. 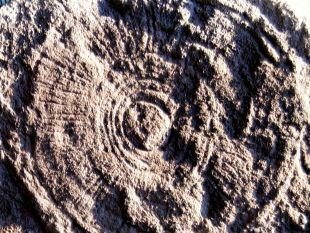 The tubular structures in the fossilized mud were 3 to 6 millimeters in diameter, and up to 18 centimeters in length, geologist Abderrazak El Albani of the Institut de chimie des milieux et matériaux de Poitiers-CNRS and the team wrote. The tunnels, which filled over the eons with pyrite minerals, were found in the same spot – “the same location, the same outcrops,” El Albani tells Haaretz – near Franceville, Gabon where in 2010 the same team had found the earliest multicellular forms of life, also naturally 2.1 billion years old. To be clear, in their latest work the team were not looking at fossil animals. They were looking at tunnels they found in fossil sediment. But based on multiple analyses, they dismiss the possibility that the tubules were caused by nonbiological forces. Previous to El Albani’s work, the oldest specimen of multicellular life had been 1.6-billion-year-old algae found in Chitrakoot, India. It isn’t suspected of motility, though. By the era of the Ediacarans, which began about 635 million years ago, multicellular animals were thriving. But the early Ediacarans were believed to have been sessile – anchored to the seabed. 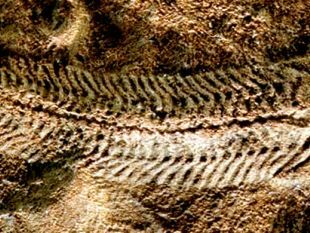 The earliest motile animals were thought to be late-era Ediacarans, around 570 million years ago. El Albani and the team have kicked back that time frame by a billion and a half years. When dealing with the facts of original life so deep in time, billions of years ago, proof is very hard to nail down. The conclusions reached by El Albani and the international team were shored up by heavy, extremely careful multidisciplinary work, each discipline answering different questions, he stresses. Life may have begun as much as 4.28 billion years ago, as the oceans formed, based on analysis of rocks found in Canada. In Australia, scientists claim to have found signals of life dating to 3.5 billion years (apropos of which, just this week, a Japanese team reported deducing that said early life wasn’t just barely eking out a living on the violent early planet – it was thriving). Signs of life that early are mainly chemical traces in rock, which are interpreted to have been biological in origin. 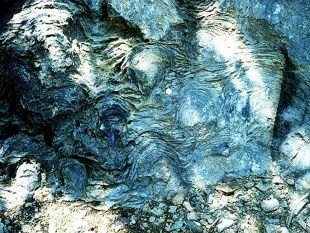 Among the oldest actual fossils, most are stromatolites (aka microbial mats), which once upon a time had been layer upon layer of bacteria. One team claims to have found tube structures dating to 3.77 billion years that they think may have been biological; and mats found in Greenland have been dated to 3.7 billion years. Bacterial mats are created by bacteria living cheek by jowl, so to speak. They are giant colonies. Each bacterium is independent, and identical – give or take a mutation here or there. Multicellular life is another story. A multicellular animal or plant is one that has differentiated cells, which carry out different roles in the whole being. In 2010, El Albani and the team described a multicellular animal in the 2.1-billion-year-old Gabonese outcrop, and now they’re describing tunnels that they believe were excavated by a multicellular animal that moved. But they don’t think the animal they found in 2010 was the one who did it. They think the shallow seabed that became Gabon had been crawling with life, in various forms. The multicellular critter the team found in 2010 looked more or less like a 5-inch pancake with scalloped edges, somewhat elongated. The team itself noted back then they could not tell whether this lobate disk was a multicellular animal or colony of one-celled animals. They certainly couldn’t tell if it got about. In any case, unless these animals rolled up from pancake to pickax, they probably didn’t dig these tunnels. The morphologies of animal and tunnels don’t fit, El Albani explains. Who did it remains a mystery. What’s pretty sure is that one can’t dig a burrow through seabed sediment if one isn’t moving – go ahead and try. Ergo, the existence of the tunnels 2.1 billion years ago means somebody was moving. But could the burrower have been one-celled critters in colony form? Also unlikely, El Albani says. Single-celled organisms, including algae and amoebas, can form colonies consisting of multiple individual cells that adhere to one another and can even crawl together like pseudo-slugs (enjoy that mental image for posterity). But a colony of multiple cells is not the same as a multicellular animal with its specialized cells and agenda. The crucial argument in favor of a motile multicellular animal is, says El Albani, that all the tunnels they found passed through layers of sediment, cutting through the layers. Some of these tunnels even have vertical or oblique sections. A single multicellular animal could have the strength and robustness to hack through the laminae (though it evidently wasn’t the lobate pancake), but not a colony of weakly attached individuals. The ancient beings were not expending precious energy to cut through laminae because they were primordially bored. Right by the tunnels are the signals of fossil mats. Their conclusion: The animals were looking for food – the bacteria – and oxygen. The Gabonese tunnels were found next to fossilized microbial biofilms, which had formed mats between the superficial sedimentary layers, as bacteria do. Previous work published in 2014 by, yes, the same team demonstrated that the stromatolites had consisted of cyanobacteria (aka blue-green bacteria), which have the remarkable capacity to photosynthesize like plants. But the multicellular beings weren’t tunneling through the primordial mud just for food, El Albani believes. They were looking for oxygen too. “It is plausible that the organisms behind this phenomenon moved in search of nutritive elements and the dioxygen, both produced by cyanobacteria,” they write. 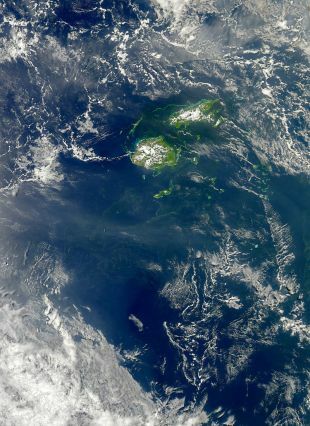 In fact, they suspect the shallow primordial seabed was teeming 2.1 billion years ago, but around then – specifically, 2.083 billion years ago – atmospheric oxygen drastically declined. Hence the suggestion that the 2.1-billion-year-old primordial burrowers were also seeking the oxygen molecules that the photosynthetic bacteria exhale. One last point. Another thing dividing hearts and minds in the paleo crowd is the evolution of eukaryotes (which is everything that isn’t prokaryotic, in other words, everything that isn't bacteria, archaea or virus). Eukaryotes have a cellular nucleus; prokaryotes have free-range DNA inside their cell. There are other differences. Anyway, El Albani points out that their motile multicellular creature digging into the seafloor had to have been eukaryotic, going by everything we know of life. Was it our mommy? We will never know. 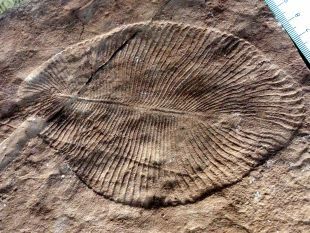 The prehistoric pancakes and other life-forms 2.1 billion years ago are probably almost all dead ends on the evolutionary tree, rather than the ancestors of our ancestors of our ancestors. Yet they were the first-known movers and shakers. It’s a start.